The team of six students developed a winning business plan for a patented, personalized therapy that stimulates the immune system to fight breast cancer. Northwestern University Feinberg School of Medicine students participated in Northwestern University’s First Annual Global Health Case Competition. The winning team will compete at the Emory University International Global Heath Case Competition in March. The degree program offers tools needed to become a leader in global healthcare and address some of the most important, far-reaching and urgent health issues of the 21st century. Yeongchi Wu, MD, has spent more than a decade perfecting a sustainable and cost-effective manner to create prosthetics and orthotics in the developing world. Variations in DNA sequence may have a significant impact on how humans respond to dengue virus. A group of scientists from Nicaragua, the University of California-Berkeley and Feinberg will seek to uncover genetic variants that make certain people more susceptible to life-threatening forms of the infection. 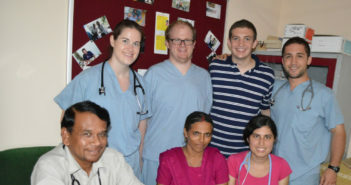 A group of medical students spent a month volunteering in urban and rural clinics and learning about public health in India. Bronwyn Rae, MD, MPH ’13, lecturer in preventive medicine, will spend the next year as a professor of anesthesia in Dar es Salaam, Tanzania, as part of a new public/private initiative of the Peace Corps and Seed Global Health.